Whorl-less Scottish handspindles, also known by their Gaelic names of Dealgan, Farsadh, or Fairsaid, are ideal for the spinner on the go. 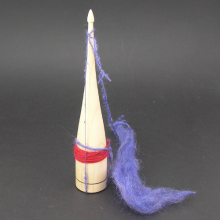 Typically used for plying, they are also popular for spinning singles. The beauty of a Dealgan is that the cop creates a center pull ball. You wind your cop on in the same manner as you would on a nostipinne. Bring the fiber through the hand cut notches on the bottom and up to the tip, securing with a half hitch. These spindles are almost indestructible making them ideal to throw in your purse or fiber bag for your quick spinning opportunities.